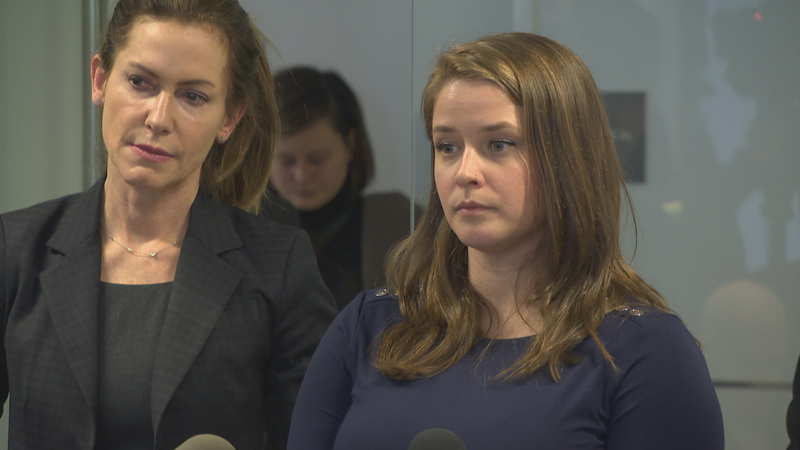 Alaina Hampton, right, speaks to the media Tuesday, Feb. 13, 2018 with her spokesperson Lorna Brett. Accusations of sexual harassment against Kevin Quinn started the #MeToo avalanche in House Speaker Michael Madigan’s office. Now, the former Madigan operative is making public statements for the first time since he lost his job in February. In a document titled “The Truth,” Quinn refutes the case made against him by another former worker, Alaina Hampton. Quinn acknowledges that he sought an out-of-work relationship with Hampton, but says he was never her supervisor, as she has claimed. Quinn also says Hampton was never retaliated against for coming forward about sexual harassment, but that Madigan didn’t hire her back because she had chosen to work on the campaign of a Madigan foe. He also says Hampton quit the speaker’s organization on several occasions to work on other campaigns, and was never directly employed by the Democratic Party of Illinois. Quinn released a series of text messages between the two that purport to show Hampton’s frustration at not rising more quickly in Madigan’s organization. “It is my belief that Alaina Hampton’s pursuit of recognition far beyond what the Organization could provide her was a motivating factor in her departure,” he says. One Democratic state representative who has been harshly critical of Madigan’s handling of sexual harassment complaints didn’t have a lot of love for Quinn’s rebuttal. “Gimme a break. This is the oldest trick in the book. Just another offensive tactic from the old playbook that aims to discredit and undermine women who come forward. Women considering speaking out should not let Mr. Quinn’s despicable behavior deter them,” said state Rep. Kelly Cassidy (D-Chicago). Hampton has sued Madigan’s organization and attorneys for both sides were in court Wednesday. Madigan’s team is seeking a dismissal of the case.